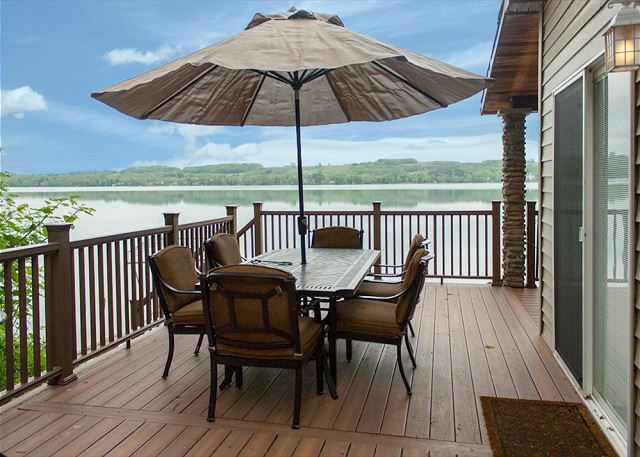 Brandy Bay Serenity offers luxurious lakeside living with all the comforts of home! 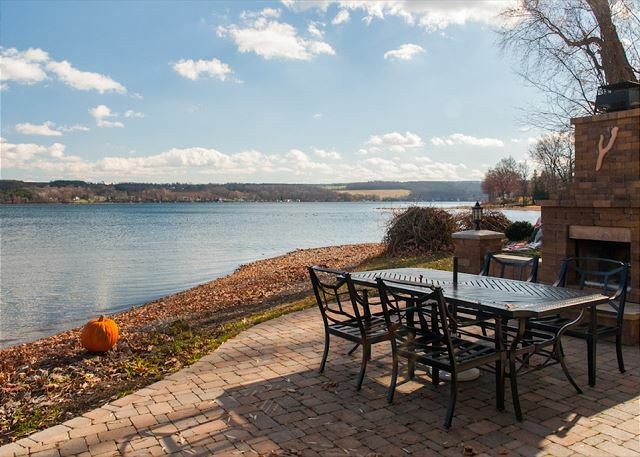 Located in popular Brandy Bay, one of the most sought after spots on Keuka Lake, this 2 bedrooms, 1 sleeping loft contemporary boasts over 120 feet of gradual lake frontage with ample outdoor living space. 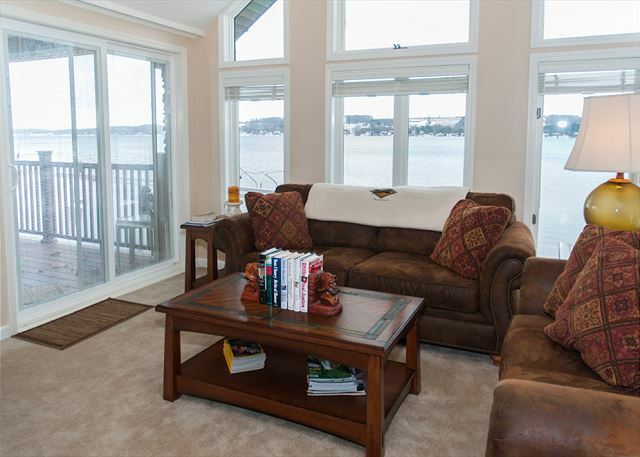 This home sleeps 12, and is beautifully appointed to provide both charm and comfort. 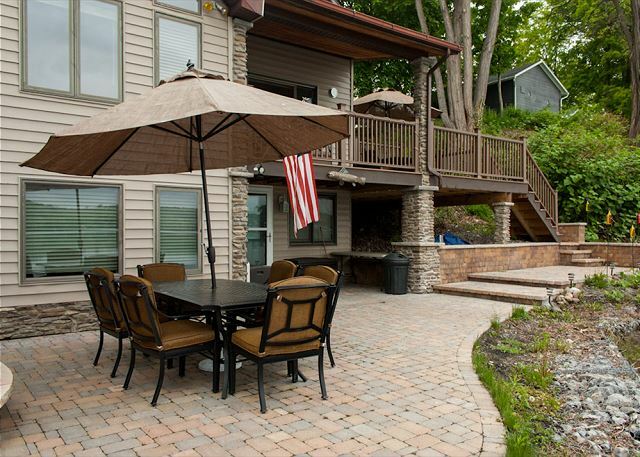 As you enter into the first level, you are greeted by its calming, lake themed ambiance. 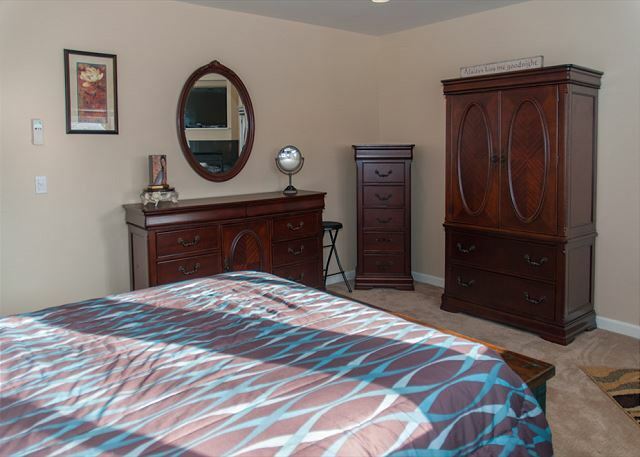 The sunken master suite is located directly off the main entryway. 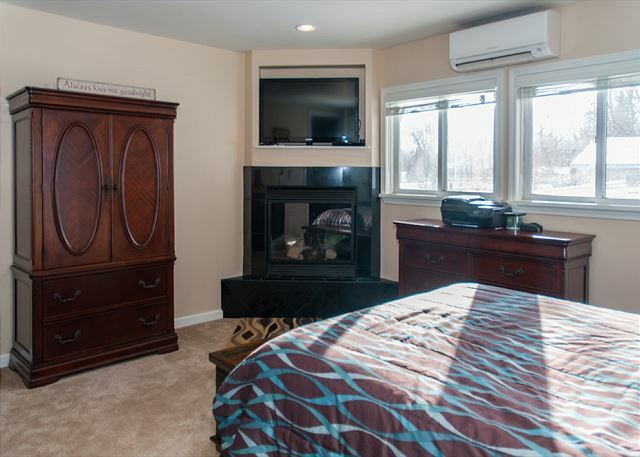 This spacious room boasts a Queen Size bed, gas fireplace, and flat screen television. 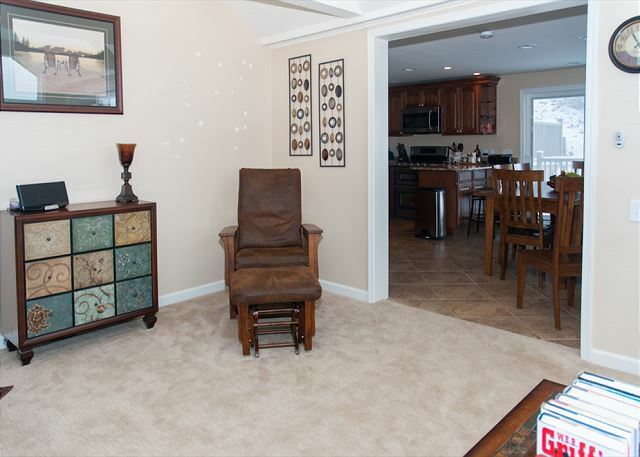 Across the hall, you will find the first full bathroom. 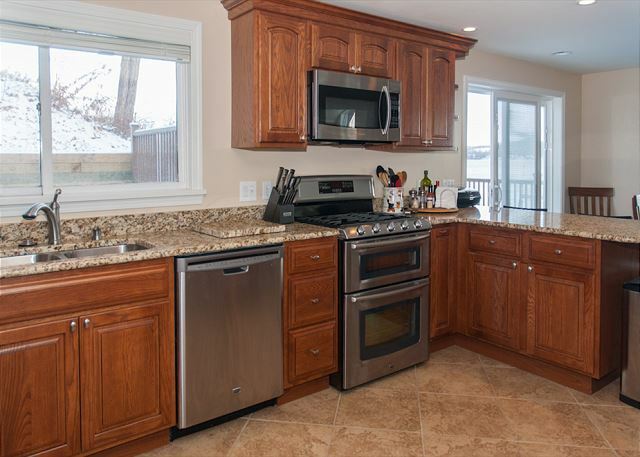 Just through the foyer is one of the home’s best features; an upgraded chef’s kitchen complete with high quality stainless steel appliances, granite countertops, and abundant counter space for easy meal prep! 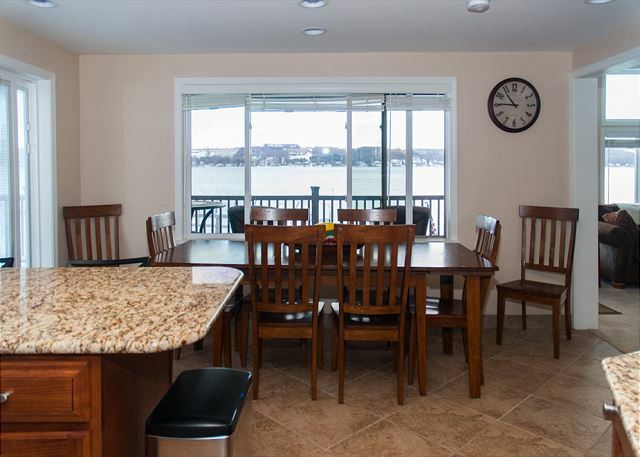 The dining table just off the kitchen seats 8 comfortably, with 2 additional stools at the island breakfast bar. 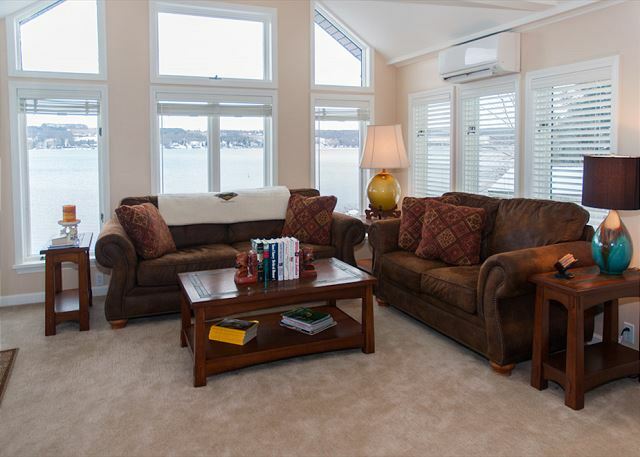 Enjoy meals with family in friends overlooking the water via the picture windows, or in fine weather on the spacious partially covered porch. 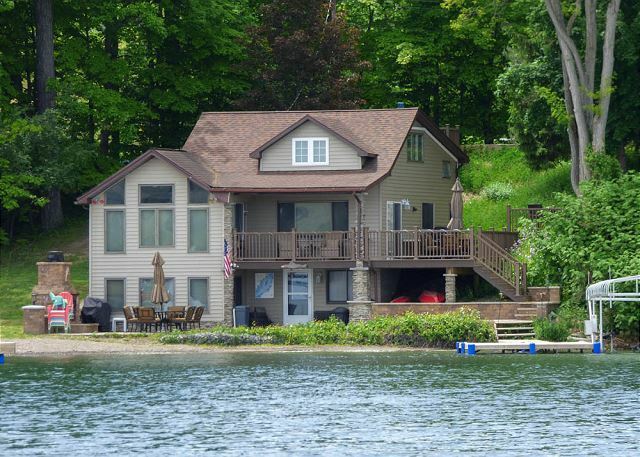 The bright and open living room boasts a Queen Size sleeper sofa, vaulted ceilings, a flat screen television, romantic gas fireplace, and outstanding panoramic views of Keuka Lake. 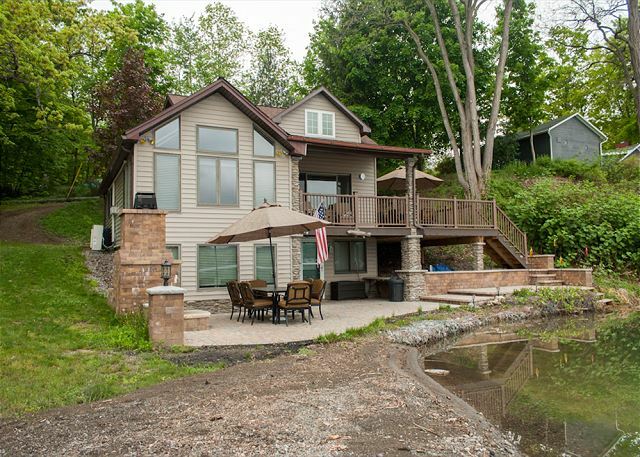 The upper deck overlooking the lake can be accessed through a set of sliding glass doors from the dining or living room, and wraps from the front to the side of the house. 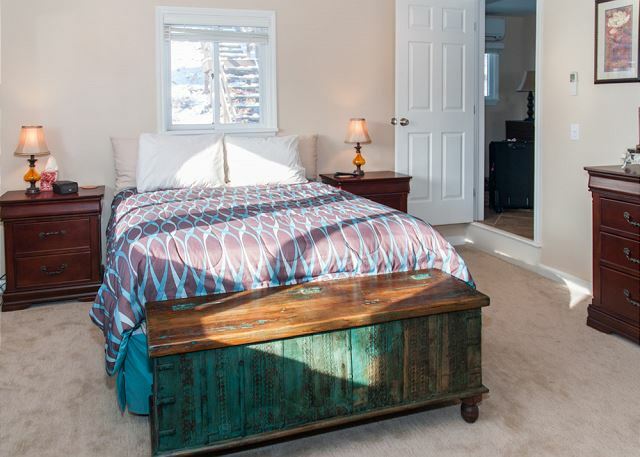 Designed with convenience in mind, upstairs you will find the , mostly private loft space with 2 Twin Size beds, a King Size bed, and a Queen Size bed. 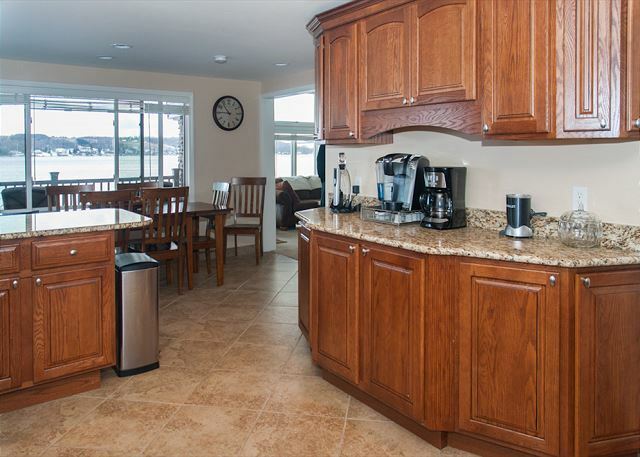 Also located on this level is the second full bathroom with a shower. 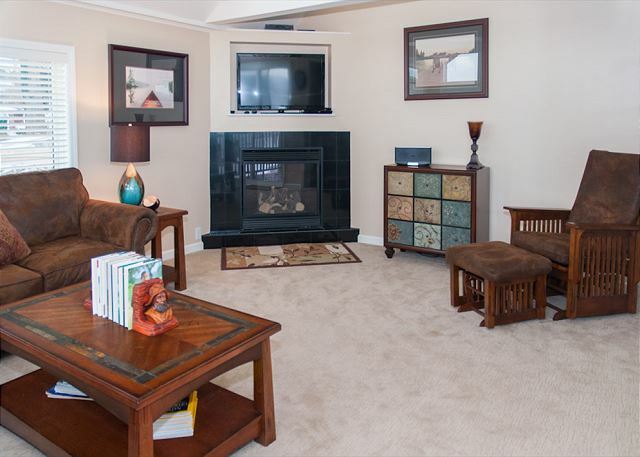 As you descend to the ground floor, you’ll enter the large recreation room. 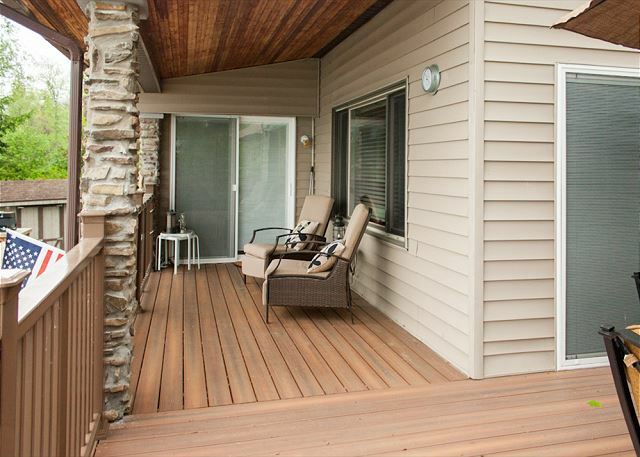 Comfortably furnished with additional sleeper sofas, this area is ideal for children and young adults to gather, while providing direct access to the immaculate outdoor patio and unique fire pit. 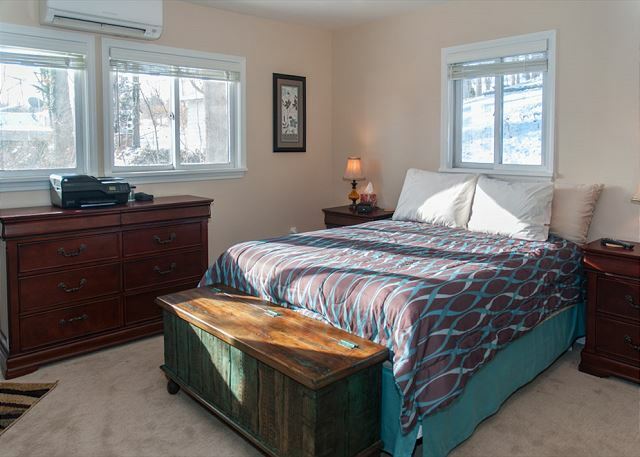 The ground floor also contains the home’s second bedroom, which features a Queen Size bed and crib. 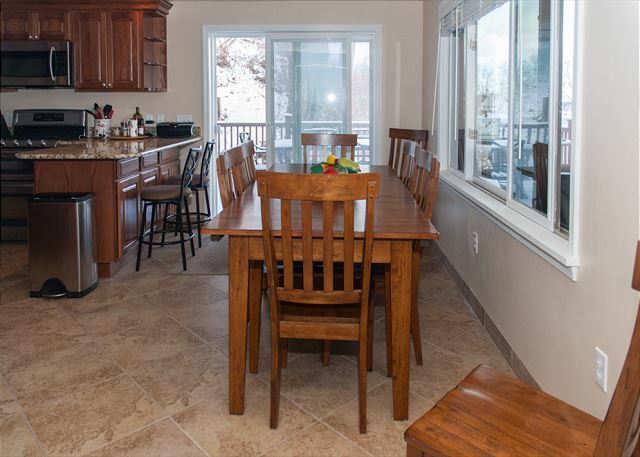 The laundry room is conveniently located on this floor, making clean up after a day on the lake easy! 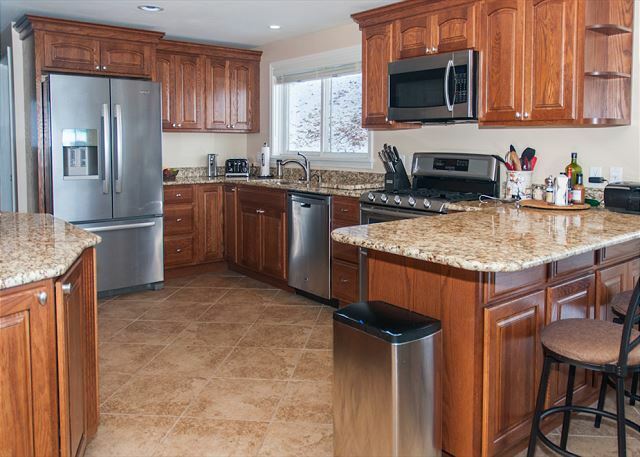 A second full size refrigerator in the laundry room is provided for beverages or food for the grill. 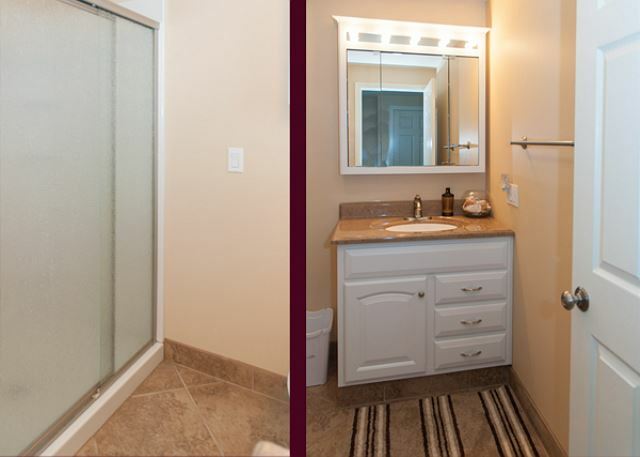 The third bathroom in the rear is complete with a full size shower/tub combo.